Trumpeting his support for the sharing economy, GOP presidential candidate Jeb Bush took Uber to a San Francisco meeting Thursday. While his driver, a 35-year-old Yemeni man named Munir Algazaly, said the former Florida governor was “a nice guy,” Bush wasn’t able to win his vote. Algazaly told TIME that if he casts a ballot in 2016, he will vote for Hillary Clinton. But the Uber driver’s support for the Democratic front-runner isn’t that hard to understand — Clinton has criticized companies like Uber for relying on a profit-sharing model that treats its workers as contractors rather than as employees, thereby not guaranteeing them overtime, guaranteed wages, and other labor protections. Bush, in turn, has repeatedly cited Uber as an example of how innovating companies can disrupt existing markets to generate jobs and reap profits. Bush rode with Uber on his way to a meeting at Thumbtack, a start-up that pairs small businesses and service providers with consumers through an online marketplace. Algazaly picked the presidential candidate up in a black Toyota Camry, but he had no idea just who he was ferrying across town until the car showed up at the start-up’s headquarters and was immediately mobbed by a dozen reporters. According to The New York Times, Bush sat up front and chatted with him about “the city, traffic” on their ride. The five-star rating, however, didn’t help Bush convince Algazaly to give him his vote in 2016. TIME reports that Algazaly said he wasn’t a regular voter, but would be supporting Clinton if he made it to the polls next year. Like Sen. Marco Rubio (R-Fla.) and Sen. Ted Cruz (R-Tex. ), Bush has long been a vocal supporter for companies like Uber, Lyft and AirBNB that have radically changed the business model by using independent contractors instead of employees to provide services cheaply and flexibly. "Gov. Bush believes harnessing innovation and fostering technology can help us grow at four percent once again," Bush spokeswoman Allie Brandenburger told Mashable. "We will do this by getting Washington off the backs of innovators like Uber, not trying to plan the future of our economy from D.C."
Bush isn’t the only fan of Uber on his campaign. According to Business Insider, his campaign staffers have already spent $1,400 on the car service. The press was on hand to document Bush’s Uber ride. According to TIME’s Zeke Miller, reporters circled random cars outside the Thumbtack offices for nearly an hour before the presidential candidate finally arrived, including the taxi that Miller showed up in with his cup of coffee. Uber has long been the favorite child of start-ups among GOP politicians looking to defend greater market deregulation. Since the company began in 2009, it has revolutionized how Americans in more than 130 cities across the U.S. catch rides. With its app, the service promises to come collect passengers faster and get them to their destinations more cheaply than the usual taxi service. Uber has since grown to become an estimated $50 billion company, and leaked internal documents show that the service rakes in millions each month in revenue from the top markets. Candidates like Bush have hailed Uber’s meteoric rise and the development of the sharing economy as models for the rest of the American market to follow. But critics have argued that the company’s tremendous profits are in part due to the nature of its practices. Rather than use a more traditional business model and hiring employees to drive its cars around, Uber deploys a fleet of independent contractors who are responsible for their own cars. Because an Uber “driver-partner” isn’t technically a company employee, the company is not required to pay overtime, to make sure that the driver makes a living wage from working a certain number of hours or to provide health care, car insurance, workers’ compensation, or other benefits. When Uber first kicked off in Los Angeles in May 2013, rides cost $2.75 per mile, with an additional charge of 60 cents per minute if the car was moving under 11 mph. But by fall 2014, Uber had slashed its L.A.-based fares in half to compete with Lyft, another ridesharing service, and drivers were finding they had to work many more hours to make the same amount per shift. As of last September, drivers could expect to make $1.10 per mile with an additional 21 cents a minute for stop-go traffic, and Uber still skims 20 percent of that off the top. Added to its lack of legal labor protections for drivers, Uber has not shown much sympathy for the people who make its profits possible. If drivers turn down too many fares or don’t perform well in rider ratings, the company can deactivate their accounts without warning, cutting them out of the equation entirely. Over the past year, drivers in some of the cities biggest markets have banded together in attempt to protest the service’s new lower rates and exploitative practices. But by its very nature, the sharing economy depends on a decentralized and fragmented labor force, which means that drivers don’t possess the same kind of clout as a unionized (or unionizable) workforce would with the company. When asked at a question-and-answer session with the press Thursday about Uber’s labor practices, Bush did not seem concerned, reports The New York Times. 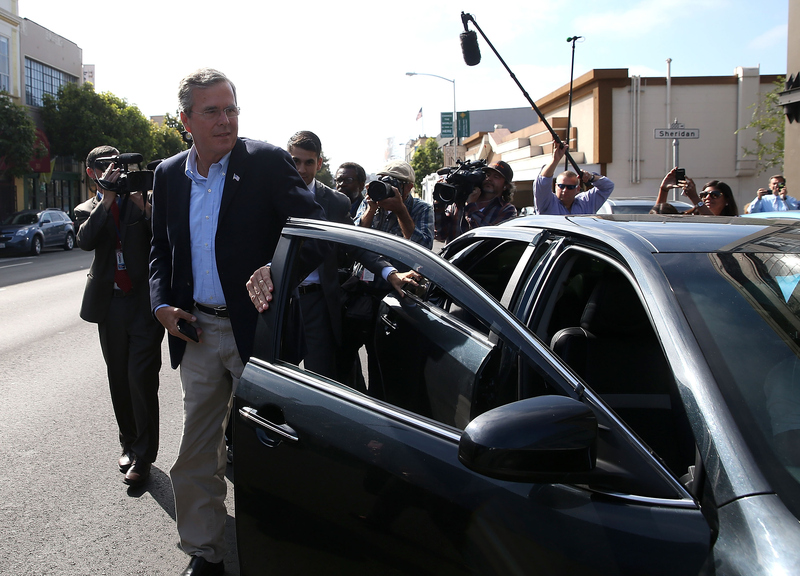 After meeting with Thumbtack’s employees, Bush hailed another Uber ride, this time with a Democratic supporter. “Can you handle this?” a Bush aide asked the driver.